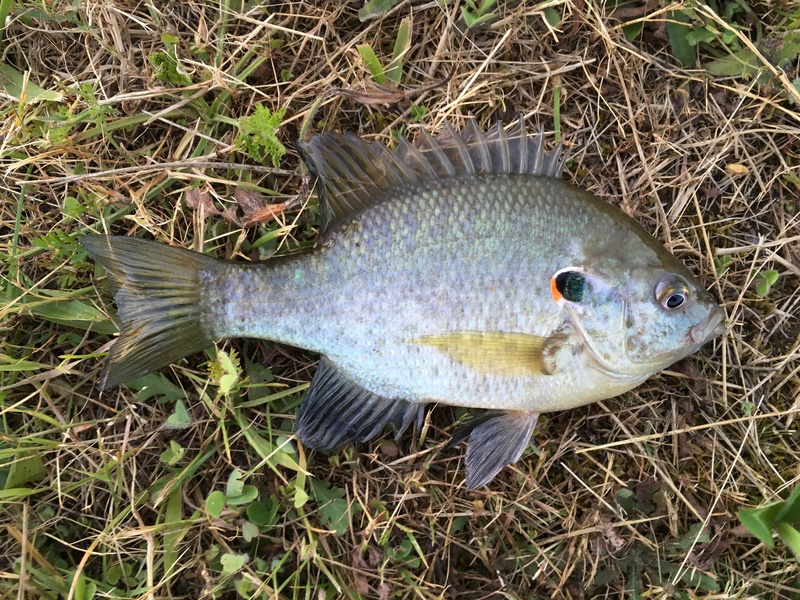 These guys have all sorts of hicknames down south, but their proper name is Redear Sunfish. Though the movie Ready Player One was entirely different from the book, both media outlets were phenomenal. Though I’m not much of a gamer anymore, I still love books about the art of the game. For that reason, I’d like to share the most gamified experience of my fishing career. Welcome to the Legend of Wilson: Redear in Time. Background: After a long day traveling to Corvallis to visit your brother, you find you have some extra time. Not wanting to waste the waning daylight hours, you decide to chase a species you’ve never caught before, the Redear Sunfish. You’ve learned they can be found at the E.E. Wilson Pond, a mere 30 miles from your brother’s house. Objective: You have about three hours of daylight left. Locate E.E. Wilson Pond and catch your Redear Sunfish. Time Left Until Dark: 3:00:00. Checking my starting inventory, I realized I had rods and reels, hooks, and line. I wouldn’t need to climb into the belly of a great tree to find my basic weapons, but I needed ammo for these weapons nonetheless. I had no bait, and this late in the year, you need worms or crickets or grasshoppers to seriously target sunfish. I could track down worms, but that would mean losing time. This first step involved information gathering. I asked my brother Gabe where the closest sporting goods store was. He told me it was Big 5. I called and struck out before that story line could even begin. They don’t sell worms. I asked his roommate Trent if he knew of any other spots. “I think Bi-Mart sells them, but that’s almost back in Philomath,” Trent said. The closest location still open that sells worms would cost me about 40 minutes all told, but it was a necessity. I accepted the subquest. The traffic was killer, and I had to defeat several cops in the game of intermittently speed whenever possible, but I made it with time to spare. Entering the store, I was asked for a Bi-Mart card, which I didn’t have. I could jump the gate, fight my way in, or use a third option. My Charisma stat was high enough, so I chose that option and made it past the checkpoint. Racing through the aisles, I finally found my target. Carefully, I avoided the pitfalls noobs always succumb to and checked to make sure the worms were alive. Good thing I checked. After five or six cans, I’d beaten the minigame and claimed my prize. Time Left Until Dark: 2:33:00. I thought this would be easy. I loaded “E.E. Wilson Pond” into my phone, and I was promptly directed to a location about 30 minutes north of Corvallis. Minutes into my drive, I noticed the ticking sound in the background soundtrack speed up slightly. I was 30 minutes into the game. After arriving, I quickly realized the waterway wasn’t E.E. Wilson Pond. I could gamble and fish it, hoping to find a Redear, but this fish was incredibly rare in Oregon, and I didn’t like my odds. As I sat in the parking lot, wasting valuable time, the background soundtrack sped up again, and I realized I was down to two hours. Frantic, I regrouped and completed the level uneventfully, checking the first location off my World Map. For some reason, service was poor, and I wasn’t showing up. Maybe I had to earn the Compass. Time Left Until Dark: 1:58:30. I opened my World Map again — how I hate this app sometimes — and located the next location that seemed likely. I drove like mad, arriving at a pond near the Fish and Wildlife Office. I unloaded my gear, but my Strength wasn’t high enough to carry all that gear, so I had to unload some of it for the journey. The bait wasn’t working. It wasn’t long before I noticed a small pink lure snagged on a log. If video games had taught me anything, it was that the sinking lure always catches bigger fish, but I wasn’t after bigger fish, and I had no time for sidequests — even if that meant leveling up. After deciding to stick with the main quest for now, another angler approached me. I readied my weapon, but realized it was a friendly NPC (Non-Panfish Catcher). I was informed by the only other angler there that this wasn’t the main pond. It had carp and bass and bluegill, but according to him, it wasn’t the main pond. A quick survey of the area directed me to a hidden sign. The signage backed him up. I was not in the right place. Time Left Until Dark: 1:36:14. I cursed, hurriedly gathered up my gear, and suddenly, a boss appeared. Another guy showed up and kept talking to me. He kept talking, and I had no idea how to peel him away. I tried the subtle hint strategy, but this boss was clearly immune to that. I tried dancing around his words, but his questions were specific and targeted at me, and he kept landing blows. I was about out of health when I realized I didn’t have to defeat him; just escape him. The single trail to the pond was blocked by his hulking form, so I returned fire with a question about the water clarity. He let down his guard and moved to the water’s edge to look, as I said “Never mind. I figured it out. Thanks!” and sped down the now-open escape route to my car. He followed, but the earlier choice to travel light paid off. My Speed was clearly higher than his, and I got free. Service improved in the parking lot, and I added the Compass to my inventory, showing me where I was on the World Map. This made things much easier. I’d defeated the boss, and the victory sounds of my car stereo told me Level Three was done just as the time once again sped up. Time Left Until Dark: 1:30:00. This time I found it. At least, I thought. The signage clearly indicated I was at E.E. Wilson Pond, but the trees were thicker than an Instagram model, and the paths leading there didn’t seem to be well-signed. Well, this moved up my timeline. I couldn’t fish until dark. No, I now had to be back out of the dungeon with my fish caught before dark or risk being towed and earning the GAME OVER. I loaded my gear, pulled up the World Map, and quickly worked my way through the maze, avoiding bees, snakes, cyclists, and other monsters lurking in the dungeon ahead. I could outrun them all, though it drained my stamina, but I was in an all-out race. If I was caught, it was GAME OVER, and I wasn’t going to let that happen. 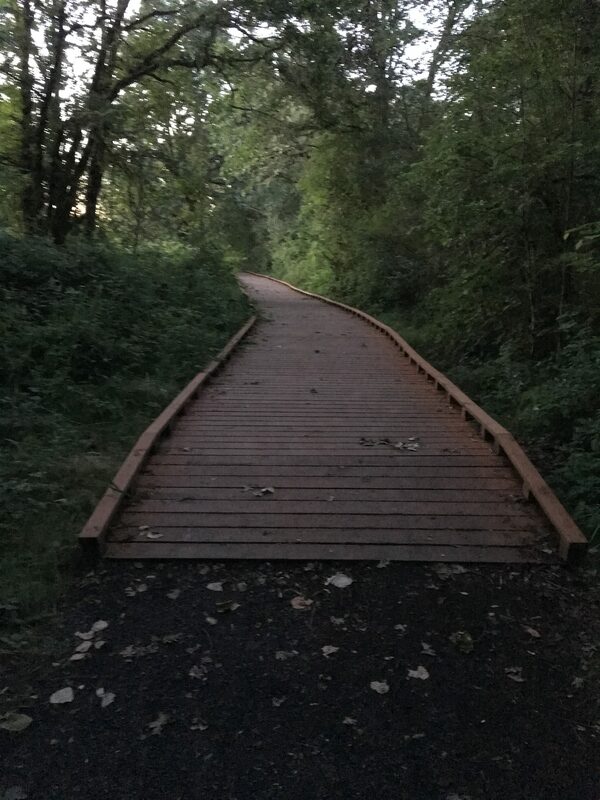 Time passed, and eventually I found a long wooden bridge through the woods. It felt like a trap, but I stepped onto it. The Bridge of Destiny was a sign I was going the right way. Halfway across the bridge, a pair of cyclists spawned and tried to knock me off. I stood firm, and they passed on both sides of me, further dropping my health, as I twisted my ankle to avoid them on the blind corner. Fearing they’d return, I hurried to the end of the bridge. Just then, an old man appeared from around the next blind corner, the rhythmic treble from his too-loud headphones serving to tell me he was essential to my quest. I asked him where the pond was, unsure if he was there as a sage to guide me or as another boss. He wasn’t wrong. This quest was do or die. I ran through the woods, avoiding the buzzing of bees in the distance. Finally, I made it to what appeared to be an earthen dike. This had to be the pond. Unfortunately, a final obstacle kept me from the water: mud. It was a relatively steep slope up, and it was thick, sucking mud. The Shoes of Nike would prove necessary when I ran back to the car after (hopefully) catching my Redear, as they provided +3 Speed, a boost I would need on the run back. Barefoot, I looked over the rim of the dike to see a weed-choked pond. Apparently I hadn’t heard the time speed up again, and in my twisting and turning through the maze, the dead-ends, and the false ponds, I hadn’t realized the two-mile-long walk/run had cost me. Time Left Until Dark: 0:58:19. It was time. Everything I’d worked towards was about to come to fruition. It was do or die. I threw out one pole with a bait rig and fished a small jig with the other, aware that dividing my attention could cause the boss to defeat me. As is always the case, I battled Bluegill and Brown Bullhead, smaller monsters sent by the Final Boss to distract me. Time Left Until Dark: 0:30:00. Then, my bait pole got a good tug, and the fight was on. It ran left, then right. We did battle, but I was so determined, so motivated, I let it dance before finally pulling it in. I assumed it was another Bluegill until the telltale red strip on the gill plate told me otherwise. I’d done it. I’d caught Redear in Time! At least, I would be close. I had just under 19 minutes left. It would be a battle. Cleaning off my feet in the dirty water, I slipped back into the Shoes of Nike, buttoned up my gear and prepared for a race to the finish. At this point, I had less than 15 minutes left, and I wasn’t quite sure where to go. I’d snaked in and out covered almost every possible trail because the individual pathways through the dungeon hadn’t shown up on my World Map. I’d have to wing it and hope for the most direct route. I heard the mocking, maniacal laughter of Andross and Gannon, Bowser and Tartarus, the Elusive Man and Sephiroth all coalescing into one evil presence just on my heels as I ran for all I was worth. At 10 minutes, I hit a dead end and had to regroup. I tripped and landed on a rod, breaking off an eyelet, but the rod remained intact. It was almost pitch black now, and I didn’t think I would make it. I couldn’t run with my Flashlight up because I’d opted not to buy the Headlamp at the Shop earlier in the game. How I regretted that. Five minutes to go. I was out of breath, so I stopped to check the World Map one more time. I was close. Very close, but a thicket of trees separated me from my car. I cut through some trees, hoping I wouldn’t get poison oak, and I again found myself at the Bridge of Destiny. This was it. I knew I was close because despite having found this after lots of aimless wandering, I was only one turn and a straight stretch from the parking lot. I arrived at the car soaked in sweat, just to see an idling Fish and Wildlife vehicle waiting for my car to leave. I quickly loaded my gear, and the truck drove off, content that I was leaving. As my tires hit the pavement, I looked at my phone. Time Left Until Dark: 0:00:11. The credits rolled upwards on my HUD as I tallied Species #74 — Redear Sunfish. This was a hard game, and replay value seemed to be minimal, so I decided to move onto another game, a shooter: Yellow Bullhead Flats. Read the next entry in #SpeciesQuest here: Species #75 — Yellow Bullhead.